When Aries and Leo fall in love, sparks will fly! An Aries individual has much in common with the Lion. Both of them love independence and freedom and are extremely energetic and cheerful. An Aries does not interfere too much in the life of a Leo and a Leo respects and understands the Aries’ need for freedom. Aries is a Cardinal Sign and Leo is a Fixed Sign. One of the glitches in this relationship is Aries may sometimes hurt Leo’s feelings by saying something hurtful without thinking. On the other hand, Aries may be irritated by Leo’s bossy nature and tendency to sulk. Both Aries and Leo are Fire Signs. This tends to be a very heated and passionate relationship. When it’s good it’s very, very good, but when it’s bad, there will be a lot of loud arguments and bruised egos. In this relationship, there are always disagreements on as to who’s in charge. Since a love relationship shouldn’t be about power, this can become a problem. Both of these Signs have boundless energy, so both will always be on the go. Although they may disagree often, their differences of opinion don’t last long — Aries is too busy moving on to the next challenge to brood and sulk. Leo needs to remember not to be resentful if their Aries lover doesn’t show them enough respect. But they’re both loyal and care about each other deeply, and when they can understand there doesn’t have to be a boss, their relationship can be exciting bliss. Both of them love to go out, have a blast and live life to the fullest. The Lion wants to have the best of everything and Aries will is just the perfect companion. The love match between an Aries Man and Leo Woman is one of the best. The chemistry of the duo will be great and they will happily share the limelight with each other. He loves to try out new ideas and new places and she will happily go with him to gather all those admiring glances. There will be no dearth of compliments and praises as both of them hold back nothing and the same goes for their emotions too. There will be lots of drama, excitement, fun and love in this Aries-Leo combo. Conflict arises when the Leo woman, gives attention to other males around, which puts a dent on Aries’ ego. On the other hand, Aries man’s magnetism that never fails to draw female attention in social gatherings will make the Leo woman green eyed. 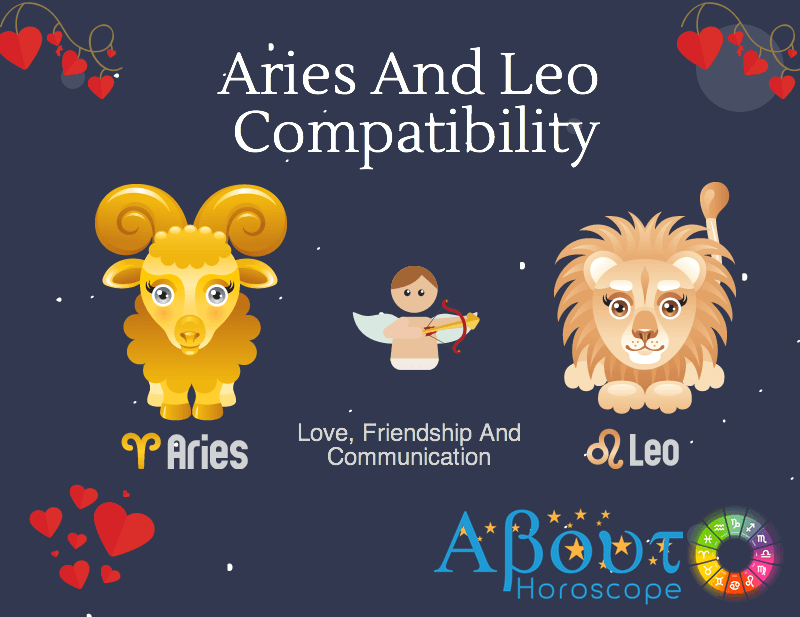 But problems between these two signs get solved very quickly as the Aries man and the Leo woman besides being lovers, are also very good friends. An occasional quarrel keeps Aries and Leo from taking love for granted, which otherwise sounds boring and uninspiring to both of them. Like two peas in a pod, Aries woman gels well with a Leo man. His confidence and outgoing personality suits her constant need to explore the unknown. The chemistry between them is undeniably on fire and their relationship has the potential to stay strong and last long. Leo man will love the intelligent and lively spirit of an Aries woman and she will be floored by his romantic and large-hearted nature. She will protect his vulnerable ego and he will provide her with a luxurious home, which is full of love and trust. Aries and Leo together make a dynamic combination with lots of passion and energy in everything they do. Appreciation and admiration is predominant but they may fall into battle of the prides every now and then. To maintain peace they both need to adjust and let the other shine instead of basking in the limelight alone. If egos and self-expressions are maintained under tight control, the Aries-Leo combination will work and grow into mutual respect, adulation, adoration, affinity and encouragement. Sharing common goals will help solidify not only the Aries Leo love compatibility, but their home life as well. And once the commitment is made, neither one will let go.